Dream Journaling is a creative process that can help with understanding and exploring the meaning of dreams. The best part? No writing or art skills required! When you learn how to make a dream journal, you have one of the most valuable tools and resources for dream exploration and dream work available to you. It's a magical and safe place for you to explore and understand dreams - and it doesn't take a lot of time, effort, or expense to do! In this post, we will go over how to choose a dream journal, what supplies to use, and how to get started and past that intimidating blank page! What is a Dream Journal? Why Use One? Think of your dream journal as your travel guide and journal when exploring your dreams. It helps you remember important dream events and details, helps you understand the language of dreams, and also helps you work through events in your waking life as well. If you want to get in the habit of having vivid dreams you can remember and learn from, keeping a dream journal is essential. Keeping a dream journal can help you understand the meaning of your dreams and will serve as a very useful guide you along your dream journey. Your dream journal will be a safe place where you can work out thoughts and emotions, problem solve, brainstorm and find creative inspiration. There is no limit for what you can do with a dream journal! Your dream journal is a place of unlimited possibilities! 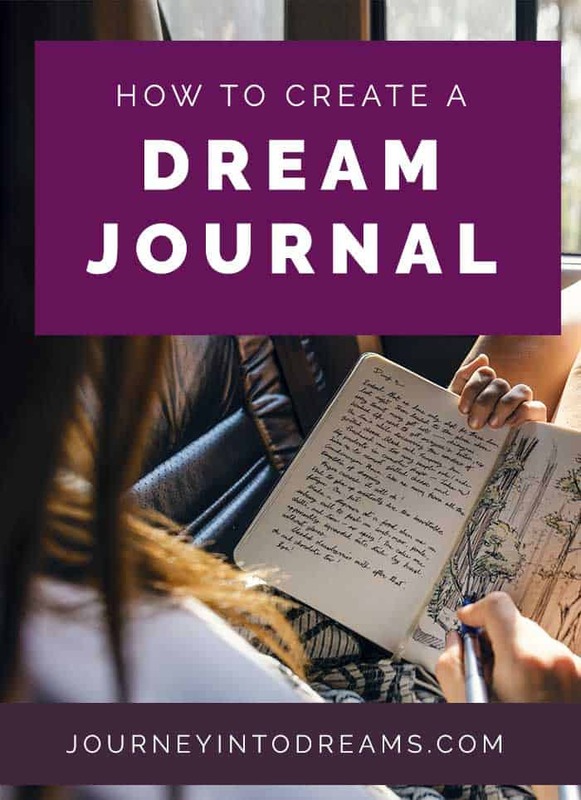 In this post will help you be inspired to practice a regular habit of dream journaling and begin a new journey that will transform the way you view dreams and your life. The most important thing to remember when thinking about choosing a journal and what supplies to work with is that you are comfortable with the materials you select and it is something you will actually use and do on a regular basis! Choose one you feel comfortable writing in. There are many beautiful journals out there, but if you’re afraid to write in it for fear of “messing it up” it defeats the entire purpose of having a dream journal in the first place! Choose a Practical Size: The size of your journal is important, because you will not want something that is too big or bulky to carry around yet not so small that it fills up too quickly or doesn’t give you ample writing space. We recommend sticking between 5 1/2 inches by 8 1/2 inches to 7 inches by 10 inches in size - anything much larger than this and it may be uncomfortable for writing in. Think About Types of Paper: You may want a lined journal, or an unlined journal, or a grid journal. If you'll be painting or drawing in your journal, you may want to use artist quality paper, such as mixed media paper or a watercolor paper journal. Composition Notebook: These are readily available at just about any store and are inexpensive and durable - you can often find them for $3 or less! Moleskine Journals: Our personal favorite, they just feel nice to write in! Available online and in some retail and book stores. They come in a wide variety of shapes, sizes, and papers. Some of our favorites are the Classic Moleskine Hardbound Journal and the Moleskine Cashier Journals, which come in a package of three. Strathmore Visual Journal: If planning to paint, sketch, or really beat your journal up - the paper weight in these are great for all sorts of creating. These are available at most art supply stores. You can also find Strathmore Visual Journals at Amazon - often at a better price than the art stores! Ultimately, the type of journal you select is entirely up to you. There is no such thing as a "right" or "wrong" journal for recording and exploring your dreams. Choose what you are comfortable with and what you will actually enjoy using! Once you have a journal to work with, you’re ready to make it your own! While this is not a requirement, it does help to invest some time into making the journal your own by personalizing the cover as this will help you feel more connected with writing in it. You don't need fancy supplies. Most you probably already have or can get inexpensively at any craft or retail store. Now that we've gone over various ideas for what you can use for your art journal and how to personalize it to be your own, you are ready to start writing and creating in it! Write an introduction page: Do a little introductory journaling about what you hope to learn from interpreting your dreams and exploring this part of your life deeper. Art & Creative Expression: Sketch or doodle in your journal. Not artistic? That's okay - you can always opt to include a photo or magazine picture. Make a list of grounding and self-care activities: If you haven't already make a list for these things, now is the time to do it! If you already have, consider rewriting it neatly in the journal or taping it into the front of the journal. Keeping this in the beginning of your journal will serve you as a useful resource when you are interpreting your dreams. Keep Track of Daily Activities, Emotions & Moods: Before falling asleep, you can write about your daily activities, emotions, and thoughts from the day. This will help you in the morning see if the dream relates to anything you were thinking or feeling from the previous day. Use Writing Prompts: Often times we can use writing prompts to help us explore a situation in life. See our post on dream journal writing prompts for some ideas and inspiration. You don't have to wait for the next day to start working in your journal or to remember a dream. You're ready to start as soon as the journal and pen are in your hand! Start writing now today what you might be thinking, or what types of things you would like to explore through dreams. Creating a dream journal can be a very rewarding experience. It is one of the most valuable tools for those who are starting to explore dream work and what dreams mean. Have you made your own dream journal? What did you enjoy about the process? What types of things do you include in your journals? Share your experiences and thoughts in the comments below!